Zoo Veterinarians have one of the most fascinating yet challenging jobs out there. They provide medical treatment to the likes of cheetahs, sloths, elephants, and other species of exotic animals at the zoo. Just as a Doctor performs physical exams on patients, Zoo Veterinarians perform physical examinations on animals to diagnose illnesses, assess injuries, and provide treatments. Do you love all types of animals? Will this love sustain them through eight years of postgraduate education and training? And finally, are you willing to enter a highly competitive field? If the answer is yes to all three, then you have the right passion and discipline for the career. The road to becoming a Zoo Veterinarian is paved with a significant amount of education. All aspiring Zoo Veterinarians must complete a Doctor of Veterinary Medicine (D.V.M. or V.M.D.) degree that can be attained at veterinary colleges accredited by the American Veterinary Medical Association. Veterinary medicine programs typically take 4 years to complete. Veterinary programs are highly competitive. Should You Pursue a Bachelor’s Degree? While a bachelor’s degree isn’t required before applying to veterinary programs, most applicants pursue one anyway. A bachelor’s degree gives candidates an advantage since veterinary programs expect students to complete prerequisite courses. These courses usually include anatomy, biology, chemistry, physiology, and animal science. Aspiring Veterinarians should always look into their prospective veterinary school’s requirements when planning their undergraduate class schedules. What Licensing Will You Need? 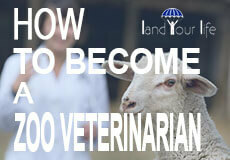 All Veterinarians need to obtain a state license before practicing. Licensing regulations vary by state but most states require both the successful completion of the North American Veterinary Licensing Exam and a separate state exam. Residency programs, accredited by the American College of Zoological Medicine, are also great opportunities for aspiring Zoo Veterinarians. Residencies typically last three to four years and offer critical field experience and networking opportunities with potential employers. Zoo Veterinarians are mostly responsible for preventative care. They conduct regular examinations on animals to ensure health. They also thoroughly examine incoming additions to the zoo family to uphold compliance with government regulations. When an animal is ill or injured, a Zoo Veterinarian provides immediate assistance to treat that animal and inhibit the spreading of disease. When an animal dies, it is the Veterinarian who performs the postmortem study to evaluate the cause of death. There is a vast array of exotic animals at the zoo, so the Veterinarian will need to train other zoo staff on how to properly handle and care for each species. Since conserving endangered animal species is a top priority for zoos, the Veterinarian carefully oversees the nutrition and reproduction of all animals. Can You Handle Working Irregular Hours? Zoo Veterinarians have a busy, unpredictable work schedule to adhere to. In an average week, the U.S. Bureau of Labor Statistics recognizes Veterinarians for working irregular hours as some clock in more than 50 hours per week. What Does an Average Day for a Zoo Veterinarian Look Like? An average day for a Zoo Veterinarian is full of diverse and challenging tasks. You may find yourself operating on a tiny lizard one day, and examining a ten-thousand pound elephant the next. Most Zoo Veterinarians start their day with a morning meeting. Daily meetings with veterinary staff are essential to keeping everyone on the same page and apprised of important information. During meetings, veterinary staff discuss animals with improved conditions, animals that require extra care, and surgical procedures booked for the day, among other topics. Zoo Veterinarians will often have a list of animals they’ve planned to examine that day. First, they anesthetize the animals in order to safely transport and inspect them. Then, they examine the animals by drawing blood, assessing dental hygiene, collecting swabs, and a variety of other routine inspections. Zookeepers who get to spend ample time caring for and getting to know animals will often be the first to notice when something is amiss. If an animal’s appetite decreases or if an animal shows behavioral changes, the zookeepers immediately notify Zoo Veterinarians. The Zoo Veterinarians then come by and do initial assessments and diagnoses before administering treatment. Zoo Veterinarians provide animals who have already been treated for an injury or disease with follow-up care. Zoo Veterinarians check up on past patients, making sure all of the animals who are showing clear signs of recovery. At the end of each day, Zoo Veterinarians maintain and update medical records. They send out samples that labs need to analyze, such as blood work they’ve collected earlier in the day, and record findings from their work. While the five responsibilities mentioned here look great on paper, the reality is, Zoo Veterinarians can experience unplanned emergencies at any second. These emergencies take precedence, making an average day in the life of a Zoo Veterinarian not so average after all. Are You Suited for a Zoo Veterinarian Career? Zoo Veterinarians possess a combination of key personality traits and skills that make them remarkable at what they do. Predictably, they are compassionate people. It is this compassion that allows them to comfort frightened animals and adequately care for them. Zoo Veterinarians also show incredible perseverance. Completing nearly a decade’s worth of education, internships, and residencies takes an uncanny amount of dedication. Their inquisitiveness pushes them to critically study different species and absorb a wealth of knowledge on each animal. Zoo Veterinarians are open-minded individuals and they have great decision-making capabilities. They’re able to think of different approaches to solving an issue before deciding upon the best possible solution. If the solution is surgery, Zoo Veterinarians employ the dexterity needed to control a scalpel. The U.S. Bureau of Labor Statistics acknowledges that Veterinarians risk being injured while working with frightened or wounded animals. Working with large elephants and dangerous cats can be daunting, but Zoo Veterinarians possess the fearlessness needed to execute such intimidating work. Zoo Veterinarians also use their strong management and communications skills to lead teams and collaborate with other zoo employees. Certification is not necessary, but is very helpful in this highly competitive field. Candidates seek board certification through the American College of Zoological Medicine (ACZM). In order to become board certified, Zoo Veterinarians must take the ACZM Certification Examination. To meet the eligibility requirements for the ACZM boards, candidates must have graduated from an accredited veterinary program, attained a license to practice, and have published at least five publications in the field of zoological medicine. Additionally, candidates must complete at least three years of professional training or six years of work in zoological medicine, after veterinary school. Once candidates meet these requirements and pass the ACZM exam, they’ll be board certified, which presents an incredible advantage in being hired. How Does a Zoo Veterinarian Find Work? Internships and residency programs allow aspiring Zoo Veterinarians to make connections and network with potential employers. However, the best way to find a job as a Zoo Veterinarian is through joining professional affiliations. The American Association of Zoo Veterinarians, for instance, has a career center that allows members to post their resumes and search through refined job listings. Several other affiliations have their respective job databases too, including the American Association of Wildlife Veterinarians, the Association of Reptile and Amphibian Veterinarians, and the Association of Zoos & Aquariums. What is the Average Salary of a Zoo Veterinarian? In 2017, the U.S. Bureau of Labor Statistics reported that the median annual salary for all Veterinarians is $90,420. For veterinarians, as of 2017, Hawaii, District of Columbia, New Jersey, New York, and Nevada are the five top paying states for the job. Zoo Veterinarian salaries, more specifically, vary by location and are dependent on the experience level of the individual. One primary tip is to become board certified. Zoo Veterinarians who spend the extra years becoming certified earn higher salaries and can skip associate positions to move on to being a full-fledged Zoo Veterinarians. Another great tip is to look for work at zoos located in metropolitan areas. According to the Association of Zoos & Aquariums, zoos located in metropolitan areas are often capable of offering higher salaries to their employees. The employment of Veterinarians is projected to grow 19% from 2016 to 2026, which is much faster than the average occupation. Since the number of people visiting zoos has increased over the past two years, Zoo Veterinarians can expect to experience this growth too. Oversees entire veterinary staff. Duties include managing the care of all zoo animals, training staff, and preparing budgets. Chief Zoo Veterinarians must have a DVM degree, board certification, and license to practice. They also need to have three to five years of clinical and field experience in an accredited facility. Zoo Veterinarians who have critical managerial and communications skills are better suited for this position. Average salaries vary by location and experience, including $134,488 at a Los Angeles zoo. Conducts medical examinations on all animals, implements preventative care measures, and provides treatments. Zoo Veterinarians require a DVM degree, a license to practice, and two to five years clinical and field experience. Compassionate, experienced, and dexterous individuals are suited for the position. Average salaries vary, with a high of $108,304. Assists Zoo Veterinarians with animal examinations, medical records, and the maintenance of hospital facilities. Associate Veterinarians must have a DVM degree, a valid license to practice, and a minimum of one-year clinical medicine experience. Candidates with similar personalities and skill-sets as Zoo Veterinarians are perfect for the job. Assists supervisor, usually the Zoo Veterinarian, and learns from hands-on experience. Veterinary Residents require a DVM degree and plenty of internship experience. Like Veterinarians, Veterinary Residents must be compassionate, patient and fearless when handling exotic animals. The average salary for a Veterinary Resident is $60,578. Hello, if anyone reads comments here anymore. As a homeschooled 18 yr old what would I need to start with to become a zoo vet? I’m looking for an all around list of things I will go through in order. Like I’m taking my GED soon, what do I do next and what’s after that? Hi! I am also interested in becoming a Zoo Veterinarian, I am currently 17 years old and have known this is the path I want to take for a while. I would say that once you pass the GED, go to a reputable four year school and get a bachelor’s degree in a more general science such as Biology or possibly Zoology. Your college counselor would make sure that no matter what major you pursue, you’re fulfilling the requirements for vet school. I know this probably isn’t the help you were looking for, because I obviously don’t have experience either, but I figured I would just kind of let you know my plan of action. I’m glad to see there are young people like me passionate about the same feild!